Foreword: I originally wrote this scholarly annotation and reflection in the spring of 2014, but never published it anywhere. For additional reading, I suggest Lindsey Joyce’s great annotation of the same piece on her blog The Joycean. The short piece “Game Design as Narrative Architecture” by Henry Jenkins seeks middle ground on the conflict between ludologists and narratologists, focusing specifically on the role of game space in crafting a unique narrative experience. Although Jenkins does not completely ignore the ludological arguments, the essay is predominately interested in considering narrative in terms of the medium specificities of videogames. Particularly, Jenkins discusses game space as an avenue with which to understand videogame narrative and how information can be mapped onto a surrounding environment. Jenkins admits that ludologist writing is often polemical and bitter, one that eschews the potentials for narrative in games wholesale without substantial consideration. To sidestep the heated conflict between ludologists and narratologists and discourage the blind spots that both spheres create, Jenkins advocates a dialectic between narrative and games. The essay emphasizes spatial exploration and nonlinear storytelling, claiming, “Game designers don’t simply tell stories; they design worlds and sculpt spaces” (121). Henry Jenkins specifically privileges the role of game designers as “narrative architects” over storytellers, identifying four different approaches to game spaces that generate unique types of narratives: evocative spaces, enacting stories, embedded narratives, and emergent narratives. Before Henry Jenkins can launch into a detailed examination of his four approaches, he provides some assumptions in understanding videogame narratives in general. These assumptions, while helpful as theoretical contexts providing the background of his argument, sometimes prove misleading or restrictive. Firstly, Jenkins asserts that while “not all games tell stories,” many “do have narrative aspirations” (119). Videogames often lure audiences in with generic or formulaic familiarity to convey an intelligible narrative structure. Rather than proposing prescriptive, unbending videogame terminology, gaming studies demands a diversification and broadening of narrative and aesthetic styles beyond the rigid definitions of ludology and narratology. Jenkins’ four aforesaid approaches to game space and narrative represent less a rigid categorization of style and more a suggestion for broader development. Indeed, he argues, “…Game designers, who are most often schooled in computer science or graphic design, need to be retooled in the basic vocabulary of narrative theory,” indicating the rich tradition of narrative forms (literary, cinematic, etc.) that videogames draw from (120). However, this engagement with past narrative forms also demands a consideration of medium specificity and the new, restructured means that videogames approach storytelling. Jenkins’ most interesting and effectively explicated argument revolves around his four approaches to videogame narrative: evocative spaces, enacting stories, embedded narratives, and emergent narratives. Evocative spaces can best be defined as spaces that “evoke pre-existing narrative associations,” often building upon ingrained assumptions or prior texts that lure audiences in with their familiarity (123). He draws from the game American McGee’s Alice (Rogue Entertainment, 2000) to explain how the eponymous designer repackages the familiar setting and tropes of Alice in Wonderland to entice audiences with something recognizable before subverting their expectations with a wholly new story. Evocative spaces are often in dialogue with existing, recognizable stories, allowing audiences to broaden or inform their understanding of a prior text. 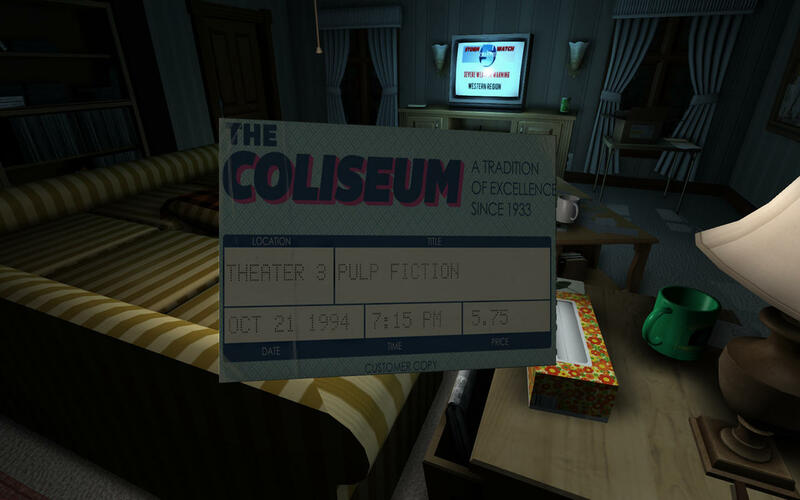 Recent examples The Stanley Parable (Davey Wreden, 2011) and Metal Gear Solid 4: Guns of the Patriots (Kojima Productions, 2008) also draw upon existing game spaces in order to appeal to or even subvert an audience’s memory of a recognizable space. The prior example involves a branching pathway that players can follow, unexpectedly pitting them in a modified opening space of Half-Life 2 (Valve Corporation, 2004) that consequently demands a multitextual reading of game space. 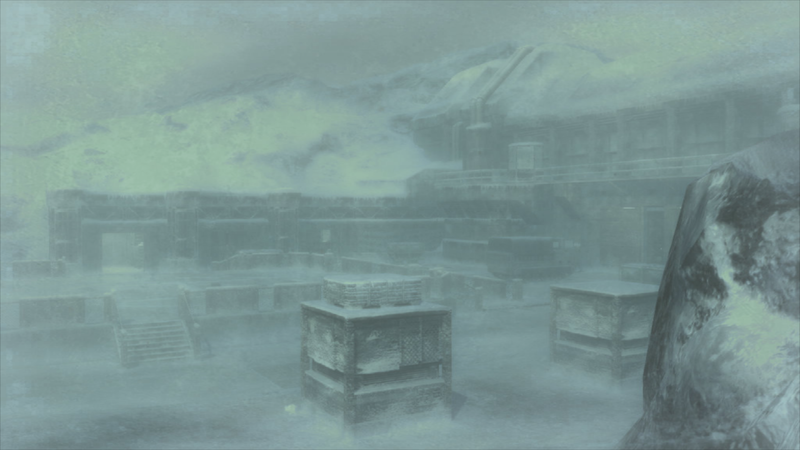 The latter example reintroduces the iconic “Shadow Moses” segment of the original Metal Gear Solid (KCEJ, 1998) game under a new narrative context. Both examples suppose a collective videogame unconscious that recognizes the fourth wall breaking dialogues that these games raise, conveying the knowledge, desires, and assumptions that we take into games and mapping it onto game space. Enacting stories provides “a staging ground where narrative events are enacted,” an approach in which story “may be structured around the character’s movement through space and the features of the environment may retard or accelerate that plot trajectory” (123 & 129). Henry Jenkins unfortunately overlooks providing us with concrete examples of how enacting stories are manifested in specific videogames to clarify his term, but this approach does make clear its emphasis on spatial exploration and progression as essential to videogame narratives. To this analysis, I put forward games like Journey (thatgamecompany 2012) and Passage (Jason Rohrer, 2007) as games that demonstrate enacting stories, underscoring the progression through space as the dominant means to experience narrative. Of further significance within an overarching narrative progression lies individual micronarratives, a microcosm of narrative within the large-scale outline of the game. These can include cut-scenes, animations, dialogue, NPCs, objects to interact with, etc. These elements may not have a significant bearing on the grander narrative but are noteworthy additions that can color the player’s experience nonetheless. The recent art comedy Jazzpunk (Necrophone Games, 2014) greatly employs micronarratives to add layers of humor and personality to its core narrative, allowing players to digress in and absorb its offbeat world in non-essential mini-games and dialogue options. Embedded narratives involve “information within their mise-en-scene” that enables “the story-constructing activity of players” (123 & 129). This approach relies on the player to ascertain a narrative via context clues, textual cues, and artifacts that are loaded with meaning. Jenkins alludes to the detective story in explaining this concept, describing the two parallel narratives that exist in this genre: the story of the investigation itself and the story of the murder that has already happened. Videogames invite spatial exploration and player investigation to uncover greater meaning, especially in literal detective stories like L.A. Noire (Team Bondi, 2011) in which interaction with the environment is key. Likewise, first person exploration and many recent adventure games like Gone Home (The Fullbright Company, 2013) or The Walking Dead (Telltale Games, 2012) also employ the strategies of embedded narratives, imbuing items scattered around the environment with great symbolic import. Lastly, Jenkins identifies emergent narratives as an approach in which “game spaces are designed to be rich with narrative potential, enabling the story-constructing activity of players” (129). This concept suggests a level of authorship and agency allocated to the players, permitting them to define their own narrative experience and objectives in the grand scheme of the videogame. Emergent narratives provide freedoms that open room for interpretation and possibility; stories emerge based on a player’s choices and actions within game space. This type of narrative is especially visible in role-playing games like The Elder Scrolls V: Skyrim (Bethesda Game Studios, 2011) in which a player creates their own type of character and follows their own bifurcated storylines unique from another player’s experience. This term is helpful in acknowledging and distinguishing the unique experiences that players have with videogames. All four approaches aid in our understanding of narrative in videogames more generally, and even if these terms cannot account for all types of games, they are useful tools in guiding discussion in new directions. Jenkins, Henry. “Game Design as Narrative Architecture.” Noah Wardrip-Fruin and Pat Harrigan, ed. First Person: New Media as Story, Performance, and Game. Cambridge: The MIT Press, 2004. 118-130. Print.